(Bloomberg) -- U.S. energy stocks are poised to gain after underperforming both oil and the rest of the stock market, according to JPMorgan Chase & Co.
Valuation for the energy sector is at a multi-decade low, while global growth is showing signs of stabilizing with some areas seeing re-acceleration, according to strategists led by Dubravko Lakos-Bujas in an April 5 note. At the same time, there’s strong earnings-growth potential and there could be solid buyback activity this year, they said. 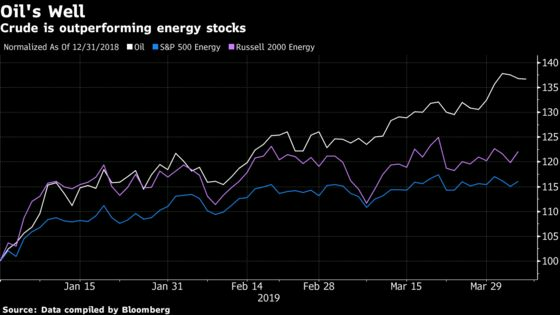 Energy is actually outperforming the S&P 500 this year, gaining 16 percent versus 15 percent for the broader gauge -- but oil has risen about 37 percent to above $62 a barrel. JPMorgan notes that the price-to-oil ratio for an exploration & production index has fallen to a record, and is currently below prior troughs including in the 1990s, the financial crisis low and 2016 intra-cycle slowdown nadir. JPMorgan also sees commodity-targeting advisers as a potential influence, noting that at times CTA assets account for 20 percent to 30 percent of open interest in oil futures.